The next day we drove in a caravan of 4 vehicles to Stanley, Idaho – taking the scenic route over Highway 12 through some amazingly steep mountain passes, but breath-taking scenery. Though Google Map told us it would take 3.5 hours, we managed to make it in 2 hours and 50 minutes. The family reunion was scheduled to take place in Stanley because my uncle owns the Sawtooth Luce restaurant there. When we arrived, they had prepared large pizzas to welcome us for lunch. Next we headed out to Smiley Creek Ranch where we had rented out the place for all 40 family members who arrived from across the nation. Smiley Creek offers standard lodge rooms (which we booked); cabins; teepees; and campsites – something for every budget. They also provided 2 wonderful dinners and scheduled a private wine-tasting for us with 3 Horse Ranch Vineyards out of Eagle, Idaho. 2008 Estate Grown Roussanne, 3 Horse Ranch Vineyards – lovely aromatic nose of pear with floral notes; dried pear on the palate with a refreshing crisp acidity; complex mineral notes, and a very long finish. Amazing! 2008 Estate Grown Viognier, 3 Horse Ranch Vineyards – classic apricot and honey nose/palate with no oak; clean with a dry finish; lighter bodied and more elegant than most viogniers. Refreshing, but finishes with a slight burn. 2008 Estate Grown Chardonnay, 3 Horse Ranch Vineyards – a very pretty elegant chardonnay with a kiss of oak to mingle with bright apple and citrus notes. Good balance with crisp acid and an intriguing floral nose. Our 3 days in Stanley also included drinking much wine and beer around the campfire in the evening, with some people staying up quite late into the night. The kids loved playing Tag and racing around the hills every evening. Saturday night’s special dinner of steak, Idaho trout and stuffed chicken prepared by the chef at Smiley Creek Lodge was excellent. We spent one crazy morning rafting down the Salmon River with 30 of us piled on 5 rafts and having huge water fights over the rapids. We all emerged completely soaked. 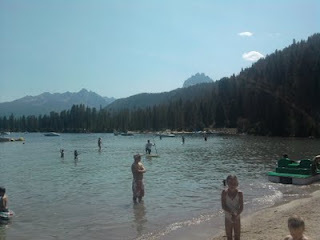 We spend a sunny and fun afternoon at Redfish Lake swimming and renting paddle boats. Hiking and horseback riding were other fun events, as well as time catching up with all the relatives. Altogether, it was a wonderful reunion and wine-tasting trip to Idaho!